Montecatini Terme, one of the top Tuscany spa towns, is in the heart of Tuscany near Florence, Lucca, Pisa, and Viareggio on the coast. It's a pleasant and peaceful town reminiscent of bygone days with a big park in the center, three thermal establishments, an elegant wellness center, high-quality shops, and nice bars and restaurants. With its many reasonably-priced hotels and convenient location on the rail line, Montecatini Terme makes an excellent base for exploring Tuscany. Montecatini Terme is on the rail line between Lucca and Florence, both less than an hour train ride. Two trains per hour run between the two cities stopping at both of Montecatini's stations and one train per hour continues to Viareggio on the coast. Both stations are right in town. The closest airports are Florence and Pisa. By car, take the A11 to Montecatini exit and follow the signs. Most parking in town is metered. 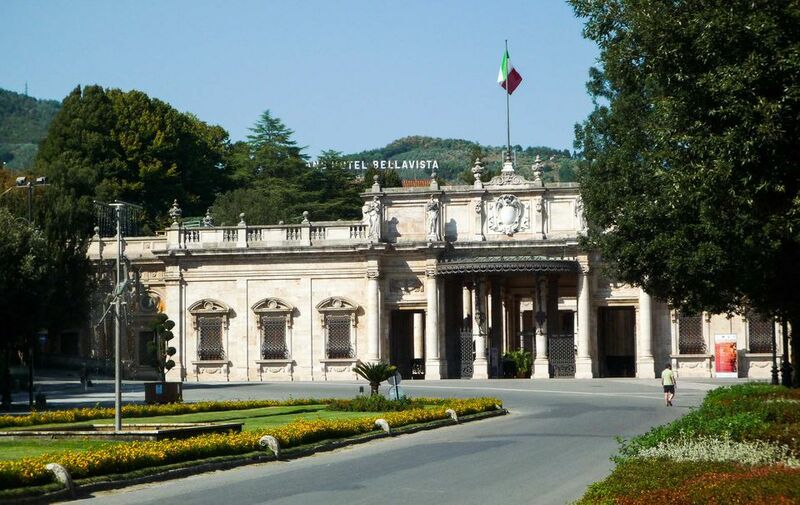 Grand Hotel and La Pace, a 5-star historic Liberty style hotel, is one of the most elegant hotels in Montecatini Terme. Explore more top rated Montecatini Hotels, from 2 to 4 stars. Terme Tettuccio is a historic spa famous for its thermal waters. It's a lavish Liberty-style building with a park and nice places to sit outside. Most days there's an orchestra in the mornings and a piano player in the afternoons. The spa is open daily from May through September and is worth visiting just to see the beautiful interior. Spa treatments - A wide array of classic and well-being spa treatments are available at the wellness centers, spas, and in the 5-star hotels. Excelsior Spa has a large wellness center with a variety of treatments including beauty, mud, massage, and baths. Terme Redi has baths and lots of modern equipment. Terme Leopoldine, another historic spa, was recently restored. Viale Verdi - The main street through town leads from Piazza Popolo to the spas and is bordered on one side by the park. Viale Verde is lined with shops, cafes, and restaurants. On this street are two theaters, the tourist office, and the historic Gran Cafe Gambrinus, still a lively meeting place. Music and theater - A wide range of musical performances are held in the Verdi Theater, Terme Tettuccio, and outdoors in summer. The summer music festival, Estate Regina, runs from late May through early October. Relax - The spa towns of bygone days were designed with relaxing vacations in mind. In addition to the spas, the park, shopping streets, and cafes are pleasant places to stroll or sit and enjoy the ambiance. Day trips - Many places of interest in Tuscany can easily be reached within an hour. Top places to visit by train are Florence, Lucca, and Viareggio. A historic funicular railway, more than 100 years old, runs from Montecatini Terme up the hill to the picturesque hill town of Montecatini Alto, where there's a small castle, three churches, a large square with restaurants and outdoor cafes, a few tourist shops, and great views over the countryside.